You guys… It is that time of the year. That time when OPI finally reveals the holiday collection of the year. And I absolutely love the theme of this year’s collection. Check for yourselves. First up is the Tiffany-ish shade of the collection – I believe in manicures. 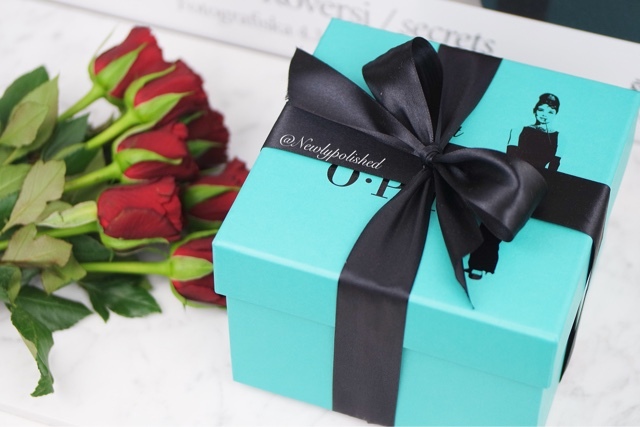 It’s not your typical holiday shade but you can’t have a Tiffany’s collection without it. I painted two coats for full coverage and the formula was great. 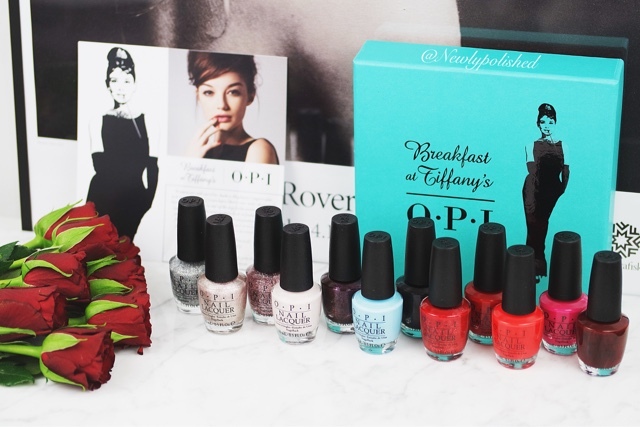 Next up is the shade named after the collection – ”Breakfast at Tiffany’s”. 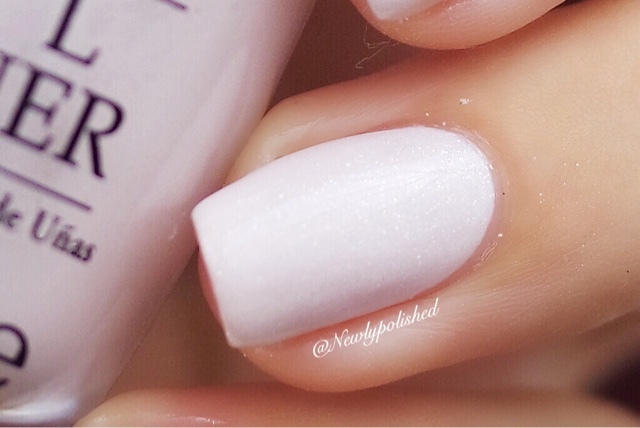 OPI describes the color as a matte pearl and I think that is pretty accurate. My camera had such a hard time picking up the gorgeous tiny glitters in the polish, so it is really even more gorgeous in real life! I always say this when it comes to metallics, but they aren’t usually my cup of tea. But I have to stop saying that soon because I’ve come to like them more and more! 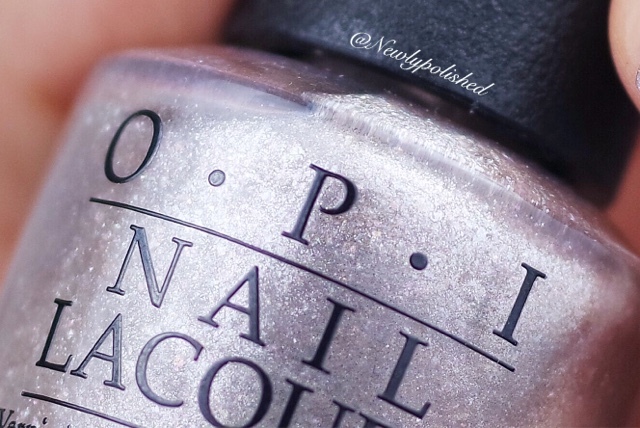 OPI Five-and-ten is metallic shade with a ton of small glitters in it. It is not streaky at all (Halleluja!) but it takes three coats for full coverage. I will definitely be wearing this shade during the holidays. OPI Apartment for two. I think the picture speaks pretty much for itself. Very pretty pink shade. Almost full coverage in one coat. Lovely shine. I think I could probably find a dupe or two of this shade in my nail polish stash and it doesn’t really feel holiday-ish but it is a perfect pink if you don’t already own one like it. OPI Fire Escape Rendezvous. In almost every collection I feel that OPI tries to really think outside the box and creates a crazy wild card. Well. FER is this year’s wild card. When I first saw it in the bottle I thought it looked really pretty but I was afraid that this would be another ”Pineapples have peelings too” or ”Is this star taken?” (the hairy shade from the Starlight collection). BUT! It’s really not. I am surprised to say but I think this looks really cute on. If you get some big flakes on your brush, I would recommend trying to brush that piece off to get an even result. But with just the tiny flakes and the perfect non-streaky red metallic base, it looks really nice! I am a reaaaal sucker for glitter. OPI Sunrise… Bedtime! is a pink/rose gold holographic glitter. 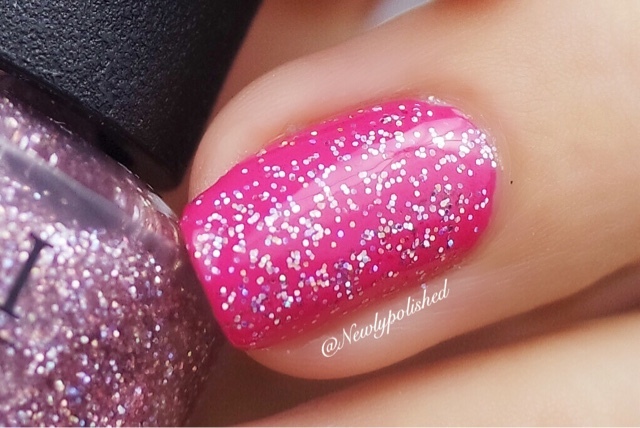 What you see on the swatch is one coat, so I wouldn’t say it’s jam packed with glitter but it still looks so pretty. I will try sponging the glitter so you really just appreciate the shade by itself. Oh, and it dries matte with the top coat, but as you can see in the swatch that is not an issue after applying top coat. OPI Champagne for breakfast kind of reminds my of ”My voice is a little norse” but a lot less glitter in is. I do however like that you can use just one coat to get a subtle effect on the base coat of your choice. I dries matte and a little like the liquid sand polishes, but I had no trouble getting the shine back with some top coat. In all, a gorgeous glitter topper! OPI Rich & Brazilian is a stunning eggplant-colored, full coverage glitter. Can you describe a nail polish like that? Anyways, look at the swatch I think you get the idea. Two easy coats for full coverage and it looks amazing! OPI Meet my ”Decorator” is a gorgeous red with orange undertones. It reminds me of ”Fashion a Bow” but with full coverage. The formula is perfect and the shade is lovely. What’s another holiday collection without the perfect red? 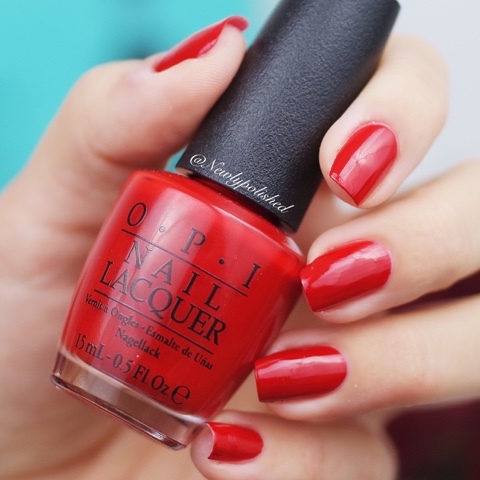 And here it is for this collection – OPI Got the Mean Reds. Just the perfect colored red and with the perfect formula. In my opinion, OPI’s speciality. I am a sucker for burgundies, so even if I have seen this shade before, I love it! OPI Can’t Read Without My Lipstick applies nicely in two coats. I read that some other watchers had problem with this shade being streaky, but I did not experience this at all. Last but not least is this satin black beauty called OPI Black Dress Not Optional. It kind of looks like the color of the tip of a pencil. Two coats for full coverage. The collection will be in stores late October. I hope you liked my swatches and please comment and share your thoughts on the collection!